Sometimes it seems like you need to invest significant capital to rank even the slightest bit higher in Google’s search results. And while quality costs money, of course, the complexity of search engine optimization tends to get over-exaggerated by marketing agencies: there’s actually plenty you can do on your own as a small business owner. 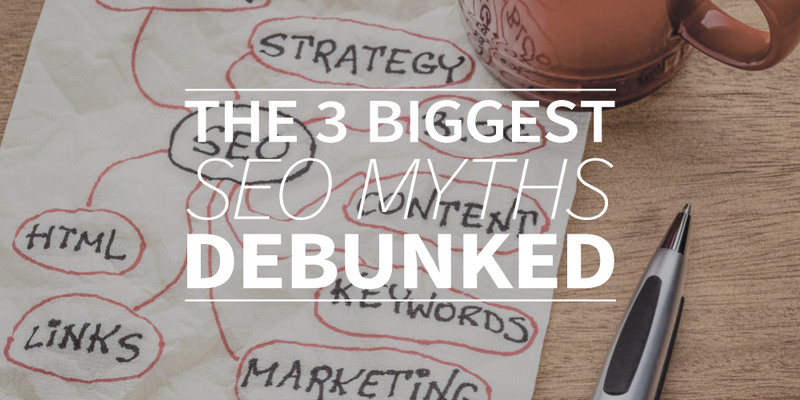 In this article, you’ll read more about the most pervasive SEO myths and how to debunk them. What is SEO and what can I use it for? Before we tackle the myths, let’s get a little background on the term. Search Engine Optimization (SEO) is a long-term strategy to get (certain pages of) your website to rank higher in the search results of relevant queries. The effects of SEO can take months or even a year to become apparent. That is quite the opposite to paid advertising with Google (SEA). The advantage of SEO is that the results are much more long-term. Once your website holds a certain ‘authority’, you’ll benefit from that continuously. ‘Ranking high on Google’ is too vague. What you really want is to rank high in searches that are relevant to your business. For a building company in Paris, for example, you would want to reach the top 5 for ‘home renovation Paris’. That query indicates a high intent to purchase. But you can also create content for searches with the intent to inform. For example, a blog post titled ‘How do I renovate my home myself?’ Anyone who then still considers it too difficult can hire your company after all. Ready for the SEO myths? Once upon a time, when MySpace still reigned over the social media landscape, when you could still get away with building a website in Flash, some webmasters discovered a clever trick to ​​​​​​​rank as high as possible in Google searches. ​​​​​​​​​​​​​​Thankfully these kinds of texts no longer work. Website visitors aren’t waiting for that, so Google now penalizes those practices. ​​​​​Of course, that doesn’t mean that you should no longer use search terms at all. Simply use them in the context they were originally meant for: to indicate an article’s content. It’s also clever to incorporate a few synonyms in the body of your text. You might want to make use of handy software that indicates whether you’re implementing search terms correctly, real-time while you write. ​​​​​​​With a search term or search word analysis you investigate how often your potential customers search for a specific term and how much competition that word has. It’s a combination of psychology and technique. It doesn’t actually call for any magic, despite what some marketing agencies might try to tell you. The myth likely grew out of those agencies’ revenue models. ​​​​​​​A savvy business owner understands what his customers want to know. Consider the questions you encounter through contact with your clients or on social media. Have you addressed those in a blog post yet? ​​​​​​​The psychological element of search term analysis is not exactly complicated. You might enjoy a little extra help with the technical side of things, though. (How often do people search for a certain term? What are potential alternative search words?) But it doesn’t necessarily need to be an expensive external party. A simple tool for search query analysis can make a significant difference. Anyone starting out with SEO can get easily discouraged by the enormous competition. As a small web shop or business owner, your chances of getting ahead of a major competitor are quite slim. SEO is much more involved than just the objective of your article. Your website’s ‘authority’ is also an important factor. How often do you feature high-quality content? How long has your website been around? How many other trustworthy websites reference your content? In that sense, it’s tricky to get ahead of mega companies like Bol.com, for example. That doesn’t mean you need to throw in the towel. It’s precisely in niche areas that you have plenty of options. You’ll run into quite a lot of competition for that one. Your odds are higher already. The power of smart search query analysis as a small business owner lies in identifying so-called long tail keywords. Those are search terms that are less frequently searched, but that can help you rank above your competitors. Google still pays attention to SEO, you can use a practical tool to conduct your own keyword analysis, and the results are worthwhile, even for small business owners. That means we can all happily banish these common SEO myths to the realm of fairy tales.